Anne-Julie Beroud, an entrepreneur and a member of Impact Hub Geneva, won the IDDEA award in December with her project La Corde A Linge, “Clothes Line”. Anne-Julie Beroud is a woman with a wonderful idea: she has singlehandedly created a laundry detergent that is environmentally friendly. Her business idea is so bright that she just won the IDDEA award, that is the sustainable development award of the city of Geneva. At the time, Anne-Julie was still working full-time as a social assistant at Hospice Général, and she continued making her detergent on the side. Then one year ago, she decided to take a plunge and become a full-time entrepreneur. 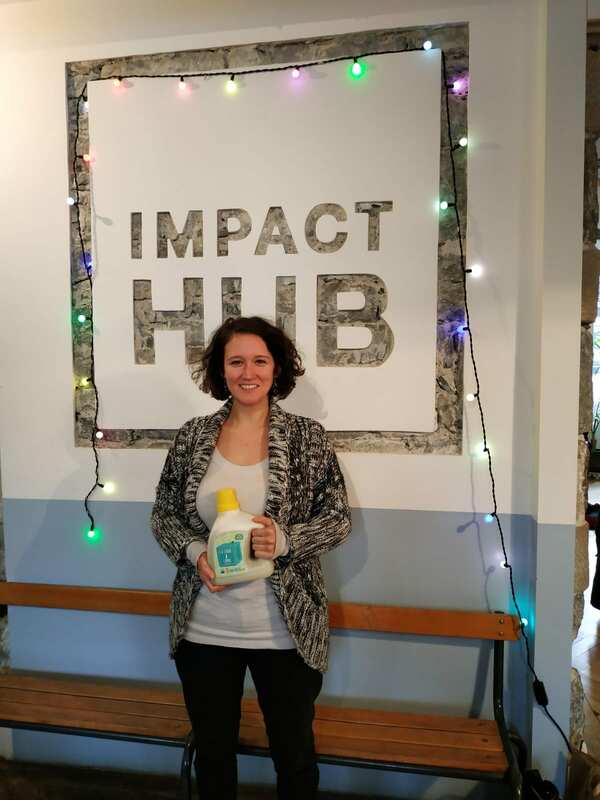 She became a member of Impact Hub Geneva after having toured all the co-working spaces of the city. “Impact Hub was clearly the best one for me, because it is the only one that takes social and environmental factors into account. And this is so much more than a working space. Thanks to networking, I have found a chemist I can ask all my chemical questions, and another member helped me to find the perfect accounting program, which saves me so much time and money”, Anne-Julie lists. Despite all the support of the community, there are naturally some dark moments in every entrepreneur’s life. Anne-Julie’s biggest worry at the moment is the consistency of her product, since the water and oil still keep separating from one another. Another problem to solve is the bottleneck of the production. At the moment, Anne-Julie produces all the detergent by herself in his father’s printing house, but she can not produce as much as her clients would like to order. La Corde A Linge is sold directly to customers and in six shops in Geneva. Some of them sell it in bulk to clients’ own containers in order to minimize waste. Starting this January, the production will take place in Geneva’s atéliers protégés, protected workshops, where it will be produced by people who might otherwise have limited access to the working market. Anne-Julie works at the Hub two and half days a week, and spends the rest of her time in meetings all over the city. She tells Impact Hub has also inspired her by its flat hierarchie. Read more about our fascinating members’ stories here.